Arguably one of the biggest surprises of the season thus far, is that of Cooper Webb. And it’s not that many didn’t believe in the speed of the young man, but the quick spike in drastic results, in regard to his positioning in the first few rounds, has been truly astonishing. He came seemingly out of nowhere to win arguably the hardest round of them all, that of the Triple Crown, and has most definitely carried that momentum through the Oakland round. Walking onto the stadium floor for practice with a swagger like no other, he seemed to be standing tall with his head held high, when talking to media and competitors alike. Deep down, you could sense that he was confident he could get the job done again. And after letting the field go, he would take a parade lap of sorts, almost as if he wanted to strut around the course with reassurance if you will. Hitting all of his marks with immense precision, he would line up for his heat race ready to baffle the field. Taking the early lead, he would look to sprint away from the field in the first three laps, with Joey Savatgy and Ken Roczen behind. With a series of players involved in this 450 mix, it was truly anyone’s race. And that could be seen on lap four, when a mistake by that of Webb would cost him dearly, tossing him into the caution lane, and now in that of third position. With the altercation of both he and Roczen in the past, he had to make sure to just stay upright, and avoid the temptation of locking bars with the Honda rider. He would do so, taking third for this particular portion of racing, and eager for the main event to begin. As the field would dart off of the line and hit the opening circuit running, Webb would take the green flag with a sprint-like mentality. Each lap, he would think of as another point earned, or another second gained. Breaking this race off into multiple pieces, each lap would inch him just a tad bit closer to the checkered flag. With an array of shuffling going on behind, he would begin to pull from Musquin, although still seeing a bit of orange hue out the side of his peripheral vision. With the halfway point becoming an after thought, he would now await for the white flag to fly. But his mechanic would be noticeably energized, relaying the message of adrenaline to that of Webb. Cooper could then feel that of Musquin beginning to creep up, and the roar of the crowd becoming more and more prominent. Getting through the final portions of whoops on the last lap, he would nail the twentieth circuit with flying colors, although Marvin was now within a few bike lengths. Never wavering, he would cross the line fist pumping and as excited as ever. He’d captured yet another victory. Riding this series for quite a few years now, Musquin has experienced many different outcomes and situation on American soil. Whether contending for race wins and championships, to dealing with nagging injuries, and even being under the same canopy as one of the greatest ever, Musquin knew that he was adequately prepared for the 2019 season, prior to its inception. With Ryan Dungey enjoying the world of retirement, the team has brought along Cooper Webb, who Musquin has become accustomed to seeing day in and day out. So although Webb may have surprised many in the pits, Musquin knew the true talent the number two possessed, and wasn’t taking the Carolina rider lightly. Throughout practice, Marvin could be seen putting respective lanes together, and doing his usual rhythmic whoop combination. He looked particularly fast in the sand section however, sitting a tad bit further back on the seat than most, and really weighing into the chassis as he ripped the meat of the whooped out berm. Nodding his head to his mechanic as he passed, they both felt he had a shot at riding very well as the night would drag on. Fourth off of the line for his heat race, he would find himself battling with Justin Brayton early on. As the number ten would give him fits, he couldn’t seem to find a permanent way around the Honda rider, until lap seven. Finally, he would put the fight to rest, pushing Brayton just a smidge behind, and conclude the race in fourth position. As the main event would be underway shortly thereafter, he would be just behind the aforementioned Cooper Webb to begin. Stalking the number two, he was rather friendly in the bowl turns after the whoop section, where he could’ve ran it a bit harder, but decided to chop the throttle and pivot instead. Making a bit of a mistake on lap four, he would be pushed into fourth on lap ten, as Savatgy and Roczen would work their way around. Savatgy, shortly thereafter, would be an unfortunate recipient of bike malfunction. He would then work his way into a third place outing; here, it was where he would pass Roczen, with a pack of seemingly rabid competitors shuffling every which way. Avoiding as much roost in the sand section as possible, he would begin to make significant strides on Webb towards the end of the moto. The five(+) second gap now a measly second or less. Inching up to the rear fender of Webb, it was too little, too late, as they nearly jumped the finish line in consecutive fashion. Second would be where Musquin would reside for the finale of the event. Taking the round of Phoenix by storm, the number four of Blake Baggett truly proved that his notion of “Mr.Outdoors” should be disregarded in a sense. Known for his bulldog like style, he would attack competitors when they were weakened, basking in the rough and rugged tracks of the summer heat. However, he would hit an oh-so certain spectacle of his career a few weeks ago, and turn a page, in regards to this chapter of his story-book tale thus far. So coming into the Oakland round, after a misfortune with a tuff-block last week, he looked to rebound and post yet another exceptional result. Padding his resume with a plethora of stats, he would look exceptional in practice, really honing in on the rutted and rougher portions of track to gain time on his opponents. Displaying a bit of leg swag as he launched up the finish line double, he would let the right ankle blow into the wind, adding a bit of charismatic flare while soaring into space. And although it may have appeared a bit leisure, he was oh so serious under the shell of his helmet. That motto would be carried into the heat races, where an early race lead would be found coupled with a heated battle with Eli Tomac. The two single digit riders were blazing a trail and setting a daunting pace in the process. The two had grown up competing against each other in the amateur series, and were all too familiar with one another’s tendencies. But it was Tomac who would get the best of the dual, as Baggett would be pushed to third, behind that of Cole Seely. As the main event action would come into the present, Baggett’s starting woes would continue, having to work his way up from a distal eleventh place. But he wouldn’t fret, staying relatively calm while working his way methodically through the field. Passing the best in the business, he truly was on an exceptional run as the clock would continue to tick. Coming past the halfway point, the crew would be in a serious mix and shuffle of sorts, with the likes of Musquin, Baggett, Roczen, and Tomac always becoming entangled. Baggett would then make the move on Roczen, pushing his position into third by lap sixteen. Securing another podium spot, the crew at KTM would sweep the top three, making all in orange extremely proud. As the series rolls into Oakland, many in the paddock are wondering if a new winner will emerge, yet again. Because although the likes of Barcia, Baggett, and Webb were definitely considered threatening prospects before the beginning of the season, truth be told, many weren’t expecting them to come away with victories for the opening three rounds. But that’s exactly why we let the races play out themselves, never letting statistics and bench racing dictate the true outcome of a race. It’s given Eli Tomac new hope, knowing that he too can hit the victory circle yet again, like he’s done in weeks past. Considering himself a true competitor, and not a rider to just fall in line, he was one of the first to take aim at the track here in Oakland, for qualification matters. Letting the mercury throughout his temperature meter rise, he was absolutely flaming with intensity as he blitzed the outer circle of the raceway. Keeping his optimal stance as he approached each and every obstacle, the coaches in his corner were most definitely pleased with his sound technique. He would then aboard the gate for the main event, with all that was needed to succeed. With true grit grinding between the likes of his teeth, he would bite down and punch the throttle as hard as possible on the green flag circuit. Residing near the first place spot, his surging confidence was abundant was he left riders like Cole Seely behind. Looking to conclude the sector in a strong manner, this sprint-like notion saw his heart rate stay in a relatively neutral zone. Coming across the line, Tomac would finish first. As he would shred the raceway to begin the main event, he knew he was in striking contention of the win to begin. No matter what his position on the track, the reassurance he carried throughout the frontal lobe of his brain, reiterated to all involved that he had the matter under control. Digging into mother earth throughout the series of small grooves, he would begin to weight the outside footpeg as the track would slicken. Fighting furiously with Ken Roczen the two would pace each other with every round on the track. Settling into the fourth place ride as the moments would close; he would honestly be a bit frustrated that he was so close to the podium. But despite all that, he knew a fourth place was sound. There are many different mentalities and ways of thinking, for respective competitors who choose to climb aboard the saddle for Monster Energy Supercross. There are those who are content being there, fulfilling dreams of racing under the lights. And then you have the guys reaching for the stars, hoping to make a career out of doing something they love. But there are few, true gladiators at heart, who are doing it for winning contention; and winning contention only. Truly willing to lay it all on the line, they understand that things might not always fall in their favor; but they damn sure are going to contend with every possible ounce of being that they have. And that’s exactly what Ken Roczen possesses. A man who’s been at the heights of winning races and championships, only to have the fear and anguish of losing creep to his doorstep. It’s been a see-saw effect of woes over the years, yet he’s remained strong, and resilient despite any adversity coming his way. He would continue the positive attitude as he absolutely tore the Oakland track to shreds, understanding that there was an “untold” confidence that came along with being the fastest in practice. Well rest assured, Roczen, you set the bar rather high. Coming out for the heat race, he was searching far and wide for the fastest bit of racing portion he could find. Whether it was inside or outside, there was little room for error as he “tightroped” the concrete floor. Nearly taking off multiple tuff-block covers, he would blitz the whoops in consecutive fashion, magnifying the smallest of windows as he clipped the top of each mogul with his respective chassis. Flourishing in fourth place, he wanted the best possible gate position possible. He would conquer the objective, taking second place. As the main event would begin, all eyes were on Webb out front. But he knew he couldn’t be lost in the shuffle, as he was doing everything in his power to toss the line and reel him in. Using him as a gauge of sorts, he would push the pace lap after lap. Throwing fear to the wayside, he was hucking every triple combination in sight, looking to pull away from Dean Wilson behind. Keeping the throttle in the most precise of RPM’s, he would wade his way through the twenty minutes, until only one lap remained. Knowing he only would have to stay on the bike, and remain unblemished, fifth would be his. As the sunlight beamed down on the California soil, the city of Oakland was delighted to see weather in the mid sixties, coupled with relatively dry air. For this time of year, you aren’t sure what to expect on the west coast, but many were thankful it wouldn’t be a repeat of Anaheim One, including Dean Wilson. Although braced for the mud, knowing that he could handle any respective condition, he felt his effort would best be displayed on dry soil, knowing that he could starch the field with sprint speed if all fell in his favor. He would circle the Oakland landscape to begin practice, surveying in a nonchalant style. He didn’t want to draw any unnecessary attention to himself, as the tricks he had hidden up his sleeve, had to be unveiled at the right time. Piecing together sections in a sleek, witty type manner, his combinations were unbeknownst to many opposing scouts, and that’s exactly what he had hoped for. He hoped to leave much of his arsenal for racing matters, surprising the competition with a heap of innovation. Shifting as fast as possible down the start straight to begin the heat race, he would duck to the inside, in as narrow of a space as he could. Nearly doing a nose wheelie as the front brake pads mashed upon the rotor, he would situate himself in the twentieth place position. As the ruts would begin to develop in a few of the corners around the course, you could tell he was thriving in any specific bend with substantial grooves. It suited his style rather well, and offered him a source of grip so to speak, as he leaned the chassis as far as possible. Inching away from Cheyenne Harmon little by little, he would take the final lap in twelfth place, pushing him to the LCQ (where he would fortunately come through with flying colors, and a bit of extra seat time). The main would be underway shortly thereafter, with all eyes in attendance focusing on the field. Coming away with seventh in the early going, he looked to keep ascending, as the laps would continue to pile up. Never faltering at the thought of fear, he could faintly begin to hear the echo of Justin Barcia’s motor, near the halfway point. And as the opposition inched closer, it was as though he would click into overdrive. Making sure that no second was wasted, you could hear him landing with the throttle at full capacity; the back wheel in full revolving fashion as he would scurry down each straightaway. Those ripples of sound waves would then fade off into the distance, granting him the sixth overall position for the evening. Throughout the process of repetition, Justin Barcia has visualized this day numerous times in regards to his thought process. Taking bits and excerpts from various coaches and counselors over the years, he’s been in a routine of sorts to visualize what he wants. Forecasting everything from the start to the finish, and even thinking about scenarios in which things go wrong, has led him to this point in his career. He realizes that adversity will follow him, but it’s how he handles those circumstances, which will define him as a racer. So with practice now upon him, he made sure to choose a variety of lines, just in case something were to occur, he would have a “backup” plan so to speak. With emergency routes configured, he would be escorted from the practice rounds with his head held high, knowing that he was ready for the storm on the horizon. As the gate would fall shortly thereafter, his riding style displayed a pure motion of swagger and confidence. Launching the “SX” triple with flare like no other, you could see him taking the left hand off the bar, adjusting his helmet in laid-back fashion. It was an act seen by Tyler Bowers who was behind, and he too could feel the collectiveness that was being displayed. That reassurance would reflect on the pit board, with the mechanic relaying signals of motivation. The rallying effort would be in full display, pushing with all of his will power to the finish line. The checkered flag would put him in a fifth position. It was all he could do to hold strong for the first lap of the 450 main, with the likes of the best in the world around him. Blitzing both whoop sections to the fullest extent, it was a matter of twisting the throttle as hard as he could. Staying in attack position all the way around the Oakland circuit, he wanted to break the mental barrier that Dean Wilson was trying to create, just in front. And it was with every showing of the wheel, or stabbing of the rear tire, that the wall would begin to crumble. Eventually, the blockade would be turned to rubble, and he would make his way around. Letting all behind eat the soil that had been chewed and sprayed by the rear tire, he saw the clock strike zero, indicating just a few short laps to go. And the seventh place position he was holding onto ever so tightly, would finally be his for the taking. Sitting down with his team and inner circle following last week’s event, the group would have a discussion of sorts, in regards to Justin Brayton’s performance thus far in the season. With spurts of outright speed, coupled with periods of stagnation, they knew that if he could keep his mind and confidence within alignment for the round at Oakland, a solid finish could ensue. Therefore when rolling to the line for practice, it was as though he had horse blinders mounted to the sides of his helmet, letting his peripheral vision become obsolete. Never once looking behind or around the rim of stadium seating, he focused solely on the foreground that lay in front. Attacking each section with the utmost intensity, he was abiding by his word given to the team, that each lap would be a display of one hundred percent effort. And upon conclusion of the qualification realm, those around him couldn’t have been happier. Suiting up to head to the line for the heat race, he was covered in head to toe with race ready equipment. As the throttle would be twisted to merge over the starting gate, his elbows were far and wide jousting with competitors. He knew he couldn’t be pushed around, as every portion of the opposition would take advantage to even a sliver of hesitancy. Running near the fourth place mark, he knew he would have to put his best foot forward, in order to hold off Aaron Plessinger, who was a few bike lengths behind. With the tread of his knobbies beginning to skate around numerous insides, he would have to be cognizant of just how hard he was stabbing the front brake. A light drag would be of necessity in order to slow down, but too much, and he could be power-driven into the ground beneath. He would figure out the calculation, taking fifth position, ready for the main event. Hitting the finish line in fifteenth on lap one, it was a matter of do-or-die as he launched the rhythm section, after crossing the start straight. With a splurge of shock and rebound to begin, he would pull the chassis into the air with all of his might during the second sequence, kissing the rear brake to conclude this specific amalgamation. With each respective round, his lead over Chad Reed in ninth place would stretch. Enlightening all of those within his camp, he landed off the finish line with a subtle nod to those close, reassuring them that he’d done all he could, for an eighth place outing. As he stood within the confines of the stadium, press day in full effect, Chad Reed overlooked the Oakland course with a mind full of wonder and creativity, looking at the diversity this track could provide. He would feel the itch running throughout his body, toe-tapping and teeth chattering, for a chance to let the 450 unleash on this west coast portrait. It would arrive soon after, and he would be the first on the track, taking mere seconds to conquer every obstacle. He would yearn for the qualification process to commence in the days after, and before he knew it, he would be back on the track again. Looking astonishingly comfortable behind the bars of this cylindrical monster, he was captivating the crowd with sheer speed to begin this practice round. Whipping the chassis into the wind, his exhaust fume would linger in all boundaries of the stadium, as his abruptness pushed bundles of fuel mixture out the silencer port. Relaying his inner emotion with thumbs up to his mechanic, he felt confident that his bike would be up to par with any other entered into the lineup. Therefore he would shoot off the line with daunting speed, taking the opening circuit in third place. With his left foot clicking the shifter in harmonic rhythm, he would etch his way through the transmission, as a constant array of RPM’s would ensue. Hitting the lower gear’s throughout many of these tight turns, he could be found shifting into third, and even fourth gear, in these duplicate whoop sections, laying adjacent to one another. His strategy would work, and in return, solidify his spot for the main event, finishing fourth. The main event would quickly be underway, as a logjam of the best Supercross riders would ensue. Finding it difficult to breathe, he had to remind himself to remain calm, despite the engulfment of chaos that lingered around. Battling with the best of the best, he showed no sign of fear as he launched into a few of these lucrative rhythm sections. Hitting the takeoffs with precise twisting of the throttle, he made sure to move his body in synchronization with the chassis below him; otherwise he could be bucked over the front end of the bike. With others around him beginning to make mistakes, he would remain steadfast, never once second-guessing his ability to endure. And it would be of success, as his confidence would generate a ninth overall finish, as the dust would settle. ​As the season is beginning to ride on and go through respective rounds, injuries are beginning to accumulate throughout the midst of the 450 division. With Stewart, Barcia, and now Jason Anderson all falling victim to devastating soil samples, it’s left many in the field reminded to seize the opportunity at hand. And Justin Bogle is well aware of what’s at stake, as each opponent on the sideline, could result in an increase of points gain for himself. Riding like a bad out of hell from the moment the green flag dropped for practice, he knew he had to assert himself as far up the leaderboard as possible. Pivoting through every respective bowl turn around the course, each apex would seemingly be cut with the scorching rear tread. Slicing through the Oakland soil like a hot butter knife, you could see the heat of the motor blistering the aluminum coating of his header, and the crankshaft below begging for mercy. Shutting the bike off as he would roll back into the pit area, both he and team were pleased with the effort he had portrayed. Loading the gate for the following heat race, he would barrel out of the gate, looking to cut immediately to the inside. Rounding the first lap in eleventh, it was a march to the front in the rounds that followed, making sure to stay as clean as possible throughout the process. Swerving left and right, he would do his best to avoid the roost of the pack, wishing that his front number plate would stay clean. As tearoffs would seemingly be ripped from the stack, his charge to the front of the field would be of the utmost concern. Due to issues occurring in the first few laps, he would pull of on lap six, and be forced to take part in the LCQ (where he would qualify, along with Dean Wilson.) Loaded into the field of twenty-two, he hoped to arrive at the front soon, wasting no time in the process. Pushing forward with all of his might, you could see the tenacious grit he was carrying, just by taking note of his riding style, as he was eager to be within the top three. Aggressively flicking the steering stem of the 450 from left to right, he was doing his best to compress the suspension on each particular face, staying as low as possible. And with Cole Seely behind, as the laps would progress, he knew there was little to no room for error, as one slight hiccup, would result in his top ten finish being washed way into the bay of Oakland. But as many predicted, he had the courage to prevail, holding onto tenth for the final lap, and securing a solid overall score. Signed on the premise of stardom and expected championships, Adam Cianciarulo feels as though it’s his time to shine, for the 2019 season. With one of the outright, best teams in all of the sport sponsoring him, he knows the team at Pro Circuit Kawasaki expects him to deliver in the near future. And Cianciarulo is a rider who welcomes the pressure, and understands the tasks that have been placed upon him. Therefore when rolling into Oakland, his mentality of winning and succession would be kicked into full overdrive. Storming the track throughout practice, he could be found violently rushing the large anthill down the one of the main straightaways. Looking as though he would launch into the realm of outer space, at the last possible second he would flick the chassis to the left, washing the tread of the front wheel up the face, and saving substantial time off the ground. Bombarded with a series of claps as left the raceway, he knew he would be in a strong position for a race win, after that practice performance. Seventh off of the start to begin, he knew with riders like Hampshire, Nichols, and Ferrandis within the heat, that he would have to make an urgent march toward the front. Therefore, he would begin to pluck away, moving past the likes of Chris Blose and Garrett Marchbanks in the process. Although an eight lap contest may seem like one of decent proportions, this particular event didn’t offer up enough time to let Adam work his way into the lead; he would finish third. But all systems were a go for the main event shortly thereafter, where Cianciarulo would position himself in the perfect slot in order to capture victory. Looking to take the field by storm, he was riding the bike in an aggressive state, with Colt Nichols closing from behind. A few laps in, he could begin to feel the pressure of the number thirty-nine creeping close, and would take a few subtle looks over his shoulder. The anxiousness would cause him to create a few catastrophic moments, nearly “looping out” in the whoops on multiple occasions. However, after a quick bit of relaxation and honing in on his breathing technique, he would settle down and let the track develop under his respective chassis. Lap after lap, the lead would continue, with Ferrandis and crew still lingering behind. But Cianciarulo wouldn’t budge; cementing his stake into the grounds of Oakland, as he crossed the finish with flames surrounding. He’d done it again, and Adam couldn’t have been more ecstatic! Showing signs of sheer speed throughout every round that has been cast this year, Dylan Ferrandis seems to be on the cusp of capturing a victory on the Monster Energy AMA Supercross tour. Although a native of France, he’s become noticeably comfortable aboard the array of technicality this championship provides, leaving the faster, more rugged tracks of the GP series behind. Now taking this with context and as a general consensus, he visually appeared to be the fastest rider on the track for this particular round in Oakland. Wheel tapping and tripling on to the plateau adjacent to the start, had him surging to the top of the leaderboard with times, but nonetheless leaving everyone in attendance double-taking at his number thirty-four machine. It would provide him with a wave of confidence, as he took off the line for his heat race. Positioned in the second round, he quickly crept up to the rear of RJ Hampshire, stalking the Honda for a few laps, prior to making the pass on lap three. It was his lead to lose after that, with the Yamaha pilot going onto lead six more laps, and capture a well-deserved heat race win. Hoping to duplicate in the main event, his seventh place start would force him to work; and work quickly in that regard. His pace aboard the glistening blue bike, had propelled him to fourth by lap eight; where he would eye Shane McElrath. With around six minutes to go, Ferrandis would hunt down the KTM, and square him up in the process. He then would set his sights on Colt Nichols, where on lap eleven, they would both close in on the second set of whoops. Running his teammate a bit wide, they would joust all the way into the following anthill. It was here, where Ferrandis’ inside line would push the Oklahoma native wide, resulting in a second place position. Keeping the front end light, he would surge toward the back of Cianciarulo until the bitter end, but again come up a bit short; second was where he would be etched into the record books. A bit disgusted with just how narrowly he’s missing these wins, Ferrandis’ camp feels as though he’s truly right there, in regards to working his way to the top. They have faith in a rider of his ability, and know it’s truly just a matter of time before the stars will align in his favor. Racking up an impressive batch of wins and top-placing finishes, Colt Nichols is portraying many veteran qualities on his quest to the 2019 250cc West Coast Supercross championship. Each race, it’s as though the ball is truly in his court, and he has to make sure not to allow any turnover’s to occur, or else the surrounding cast of opponents will begin to take reign. He’s held strong, and endured the pressure, as we all can assume will amount and increase exponentially with every passing round. But as many would presume, he walked into the Oakland arena ready to battle, taking it truly one race at a time. He knew the contenders he would have to deal with, and focused on creating a larger gap over the opposition, rather than purely on victory. If the win came, it would occur; but if not, and he could walk away with the red plate yet again, he would have accomplished the mission so to speak. After providing a solid showcase in practice, he would become suited up for the heat race, ready to do whatever was needed to get to the main event. Third off the line, he would latch onto his teammate Dylan Ferrandis rather quickly, hoping to take note of some of his lines. Noticing his outside line through both particular whoop sections, they would begin to move by RJ Hampshire one by one. Riding in a tandem of sorts, he wanted to leave a little up his sleeve, in regards to display in front of Ferrandis; he would come across the line second, behind Dylan at the stripe. He was just where he needed to be to begin the main event, quickly pacing the number ninety-two of Cianciarulo who was in front of him. Gaining little by little on the Pro Circuit veteran, he begin to really make some noise within the first few laps. Gaining through both particular whoop pads, he would nearly put his front wheel into the engine casing of Cianciarulo, in the left-hander just after the second portion. Being the clean rider that he is, he would let Cianciarulo slide by, and take his place back within the runner-up slot. It was then Ferrandis who wanted to join the party, knocking on the door of Nichols rather aggressively. Pushing Nichols wide, Ferrandis would nearly shove the Yamaha teammate off the circuit prior the final whoop section, yet they would remain upright and nearly glued together. Dylan would however, make his way around in the sand section, forcing Nichols back to third. With Shane McElrath now closing in, it was imminent that Colt stay in front of the KTM; and he would do so, rallying until the final flag would wave. Positioning himself into third, he would take the last step on the podium, and a solid amount of points moving forward. With the Supercross series undergoing numerous changes for the 2019 season, many were left a bit rattled prior to the pre-season. Television and broadcasting changes, contingency differentials, as well as a series of sponsors coming and going, left many in the industry scratching their head. And rightfully so, as one whose livelihood and income were on the line, you could most definitely understand how they would be a bit worried. But not Shane McElrath, a man who has remained focused to the utmost extent, never losing sight of the goals he’s sat for himself. So as the track map and actual layout of Oakland underwent a bit of differential change, you could tell that he was unblemished, in the sense of what to expect on the course. Nailing each and every section throughout the opening laps, he was as sound as they come while conquering the design in melodic fashion. Smooth through the transitions, no bit of energy would be wasted with either the casing of a jump, or over-jumping a particular obstacle. Heading into the heat race, everything aboard the machine felt tidy and up to par. Levers were in check, the holeshot device engaged, and the suspension was extremely push, as he volleyed the bike back and forth behind the gate. Taking off shortly thereafter, he would hover near the fourteenth place position to begin. Looking to blitz every opponent possible, the checkered flag was the only thing on his radar, as the scope would locate the nearest opposition. It was that of Sean Cantrell, and he knew the combatant had a series of tricks up his sleeve, in order to work his way around. Fast in whoop section, he looked to show a wheel in the following bend; but it was to no avail, as McElrath would cut right for the apex, shutting the door. Riding a bit defensive, his security of the position would result in a sixth place finish. The main event would shortly be underway, with a fury of the best 250 pilots contending for the golden medallion. Trying his best to ransack the front runners ahead, he showed no sign of halting as many of the series leaders would swarm him. Letting go of all hesitancy, he would hit fourth gear tapped down the longest of straightaways, nearly knifing into the top of the following bowl turn. But it was needed, to pull away from Jacob Hayes; and it would pay off, as the checkered flag would wave in the distance, letting him know that fourth place was his. Although just a bit short to Colt Nichols as the checkered flag would wave, he managed to stay within the points chase as this round would conclude. With the first chunk of this field being rather solid with factory talent, it’s truly a gamble each and every weekend to see who will emerge on top. And although we’ve had guys solidify themselves as leaders, there’s never a doubt that a new winner could emerge. All that Jacob Hayes felt would be needed, in order to secure a respectable finish that is, is that of a solid start, and mistake free laps. And although he would speak of it in a nonchalant manner, the tale of his pre-race wishes would be tall task, as the night would unfold. With the field making their way through the practice session, there were a series of lines that could create an enormous amount of mistakes. With the whoops claiming 450 riders like Justin Hill, all who had the pleasure of watching the elder class would take note of all the chaos going around. It was at the forefront of his mind as he took the track for practice, trying his best to remain silky smooth in a sea of choppy and speed-deterring obstacles. He was nailing the plateau-type combination adjacent to the start however, tripling off whenever was feasible. Dodging traffic to the best of his abilities, he found ways to piece together multiple solid laps, and look for a way to the front of the field, as the heat race would begin. Navigating with his pupils on high alert, he would defy all odds as his throttle hand would simply mesh with the waffle grip of the right side. Keeping his elbow twisted to the fullest extent, he would pull away from Michael Mosiman. Situating himself in the third place ride, he knew he would be in sound position, come time for the main event. With the field blasting out of the gate, the sheer roar of the crowd would overwhelm the sound of the engines peaking. He could feel it, and the sense of adrenaline would pour throughout his veins, an electric wave of current keeping his abilities on the highest of alert. With Ferrandis out front, he could feel the gap lengthening little by little, but he knew he couldn’t deter from the task at hand. And then it became the object of pulling away from Cameron McAdoo, who was steadily on his six, hounding at the rear tread of his machine. Keeping it together, in true Jacob Hayes form, he would hold on for an exceptional fifth place ride. As a few rounds have passed to now begin the series, many in the crowd have felt that there are a few “key” players in contention for race win’s and championship positioning. And although many of the insiders mean well, it’s put a bit of a chip on the shoulder of Cameron McAdoo. And there’s absolutely nothing wrong with it, as deep down, he knows the true ability and capabilities he possesses. He excels when the stages are of the highest tier, and when the pressure is on; so coming in to Oakland, he welcomed the exceptional crowd and lively amount of attendees with open arms. Soaring to new heights throughout practice, he would blitz the whoops with absolutely furious intent. Powering through the following left-hand corner, he seemed to be absolutely on rails as the flags would pass. Taking a bit of a break in the midst of the session, he would look around to notice anyone who was standing out, from a visual sense. With riders like Nichols and McElrath flying by, he knew if he could latch on and take a bit of note from the series leaders, that he would be in good shape as the racing would become present. He would do so, leaving the track for the qualification portion on a positive note. As the heat race would commence, he would emerge from all of the smoke and rubble of the first corner in second. Bringing delight to all of his sponsors and supporters in attendance, he was keeping the 250f humming as he starched every portion of the track. Storming across the start straight, he would launch into the following sequence of jumps, the skidplate narrowly missing the final hump before the right-hander. Every portion of airtime was scrubbed to the best of his ability; and in return, a second position would be granted. The main event would occur shortly thereafter, and he would register third on the opening circuit. Ripping through the left-hander after the finish line, his precision to hold the inside rut was rather noteworthy, as it would shoot him into the line of Shane McElrath. Holding off the likes of Mosiman and Marchbanks, he knew he couldn’t let the star power of the journeyman behind him deter his path of forward locomotion. Remaining strong-willed in the seventh position, the laps would continue to go by, almost in a blur of sorts. And then the checkered would fly, the sixth place being inscribed by his name. Walking through the pit area of this particular round of AMA Supercross, if you took a quick minute to observe the riders in their respective pit area’s, you’d be well aware of the different personalities that lay under each of the respective helmets on the line. Some, walking around and chatting, while others a bit more secluded. And Michael Mosiman could be found sitting in the corner, going over all of the lines and possibilities this track could offer, knowing that he had all the ability to do well in the event that followed. He took peace in the calm before the storm, knowing that every bit of silence he portrayed, was a matter of deep thought and concentration for the events that were on the horizon. So when he rolled onto the starting line for practice, his mechanic knew that a hint of conversation was just fine; he would let his rider bask in his thoughts, understanding of the destruction that was about to divulged. Digging the tread into this Oakland soil, he would show the throttle of this 250f no mercy, never giving the engine a second to breathe. His confidence would begin to pour into the raceway, where his tires would be slid ever so violently up the face of the “SX” triple, letting the swing arm and rear wheel follow. Always looking ahead, his intuitiveness and ability to react to any yellow flag would both keep him out of danger, and provide him with solid lap times as the practice round would conclude. As the heat race would begin, his racing instinct would heighten, almost as if he were in danger so to speak. Trying his best to keep Jess Pettis at bay, it was a matter of staying primal as the race would drag on. Others would look for a way out, and he would dive in, not ever afraid to go two and three wide if necessary. It would pay off, as the final lap would place him in the fourth place ride. Doing his best to get the front wheel ahead of his outside combatant, he would storm into the first turn and the sequences that followed. Never letting the front wheel drop throughout the whoop section, he would actually shift into fourth gear as both sections were completed. Using every ounce of power this machine possessed, he would swivel his way around the circuit, inching away steadily from Marchbanks behind. He saw the green hue of the machine in his proximity, when taking a look over his shoulder, but continued to reach as the laps went on. Seventh was his for the taking on the final lap, and a pleased contentment would run throughout his camp upon exit of the raceway. 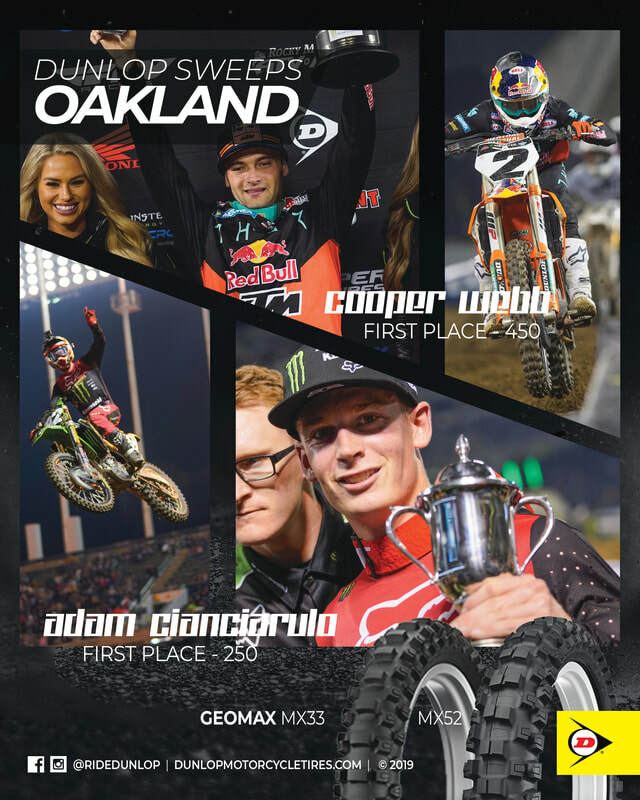 With the city of Oakland going through some major sports changes here in recent memory, the fans of the city were looking for a bit of excitement as the AMA Supercross tour was rolling into town. As this coliseum normally houses the likes of baseball and football, it would be replaced by highflying motorcycles with spectacular athletes upon them, for this respective January weekend. A fan favorite you ask? None other than Garrett Marchbanks. With fans constantly around his respective tent and pit area, he’s the first to greet those who cheer him on, with respectable hospitality. A genuinely nice guy, he understands the balance you have to have, toggling between multiple personas. It’s when the helmet comes on, that the switch must be flipped. Fumes coming from the snout of his shell, it’s as though the temperature inside gear reaches a boiling point when on the track. He turns all the inner anger, fury, and aggression, into positive results, sparking the attention of all in attendance. And it was much the same as the Oakland Supercross round was under way. Pushing the pace throughout practice, he was on a mission to put in as many solid laps as he could. He wanted to become acclimated to every nook and cranny this track would provide, so the following races could prove no hiccups. He came into the heat race with swagger that was apparent, hoping to be up front as the laps would accumulate. Fifth by lap three, there was a concoction of swarming talent that lingered within his area. With brake pads and radiator fluid heating up to scorching temperatures, there was nothing in his realm that was cooling down, especially his position on the track. With the checkered flag in the distance, he knew he had captured seventh place for good. The main event was well underway shortly thereafter, as the crowd was itching to see top-tier talent behind one specific gate drop. Rounding the first lap in tenth, he looked to penetrate the pack in front of him as quickly was possible. Showing Chris Blose a wheel in the corner just after the mechanics area, a look back from the opposition would then proceed. He knew he was in his head, and would continue to rev the bike to the moon, in order to deter the thought process of his competitor. It would work, as he would find himself in the eighth place ride with just a few short laps to go. And with the final go-around, that’s excatl where he would stay. Fine tuning the motors of the 250f’s, many of these machines are simply on the brink of explosion with just how many RPM’s they’re capable of generating. With an explosive mechanism below, riders know that they have to trust the likes of their team and crew, in order to capture the best position possible. And that’s exactly how Chris Blose feels, with an ultra strong support system around him. Knowing that all in his corner have his best interest, and he’s on some of the best equipment around, provides him with a bit of reassurance and boosting of morale. And after making a few initial rounds in practice, you could see him pull into the mechanic’s area, talking it over with his team. Listening to their advice, a nodding of the head would ensue, and they would take over, adjusting the bike to what would be of agreement. With the rebound set to his liking, and the stiffening of the rear shock being on key, he would go on to set his fastest lap time of the day. Eager for the heat race to begin, he would take in a deep breath just before clicking the bike into gear. In an instant, the field would be barricade into turn number one. Swarming like flies, he would emerge around the fourth place spot. In an urgent manner, he would begin to steadily creep away from Mitchell Harrison. He maintained his focus on the track in front of him, and it was evident with consistent lap times, never varying too far from the median. Excited for the main event that was yet to come, he would finish sixth. With the fuel tank topped off, and the tire pressure at an optimal PSI, he would float around the track in a swift manner to begin this portion of racing. Battling early on with Martin Castelo, he was displaying a surging amount of confidence as he flew by the mechanics area, roosting the number seventy-two that was behind. With a white-knuckled grip, he would feather the clutch with his middle finger only, being as soft as he could with the slipping of the motor. Hitting the halfway point near ninth, his stamina seemed to remain constant, as others would begin to flounder. Crossing the finish line on the final lap, his position of ninth would be solidified with flying colors. With the 250 series filled with talent again this year (which is most often the case), it’s tough for many of these young riders to make way in the beginning of their professional careers. Not only are they jumping into the light for the world to see, their racing guys they’ve never had to conquer throughout their amateur careers, and are now racing a series without any restrictive “age brackets.” But it doesn’t matter to riders like Sean Cantrell where he’s willing to face guys, friend or foe, from the likes of teenager, to veteran-like status. He walks to the line with a solemn demeanor, ready to fend for position as if his life depended on it. Looking to make his presence known in practice, once the caution flags had ceased, he would uncork lucrative combinations through these rhythm lanes. Landing the chassis a mere two or three times, over the course of home plate to center field, was truly absurd! The inner adrenaline and dare-devil like mentality so to speak was in full effect, and he was reaping the benefits by placing high on the time sheet. As the gate would fall for the heat race, he would come around the green flag in eighth. Knowing that he had to keep moving forward, he would simply tuck the visor down and begin to crouch in an aerodynamic mode. With the motor rattling to the point of disaster, he would chop the throttle at the last possible second into some of these turns. It was then an immediate sequence of being on the gas, where the bike would floor out of the exit. The effort had him lingering near seventh position, just ahead of Castelo. And this is exactly where he would stay, as the final flag would wave. With the field now bunched together, it was time to see who would emerge first, out of this alpha pack. Tucked away in fourteenth, he would capture the attention of the audience with just how fierce he was passing riders. Running them wide, shoving with his outside elbow, radiators were nearly being smashed with the shroud-to-shroud proximity. But it was all in fairness, and pure racing determination. Moving along as the laps would continue, he found himself in a bit of a battle with Jess Pettis. The two, neck and neck for a few laps, would begin to separate, as he found himself breaking the opposition in the smallest of margins. It would prevail, as tenth place was his across the final timing and scoring registry.